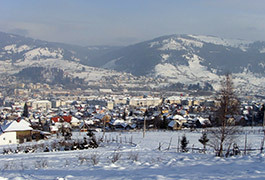 The present town of Vatra Dornei developed around the former hamlet of Dorna pe Giumalau mentioned in documents of the end of the 16th and the beginning of the 17th centuries. The site was placed along one of the roads that linked Moldavia and Transylvania, and it soon grew in importance among the neighboring villages. The site became truly significant once the authorities officially confirmed the curing properties of its mineral waters, at the beginning of the 19th century. 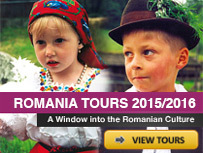 The natural mineral springs attract visitors from all over Romania. 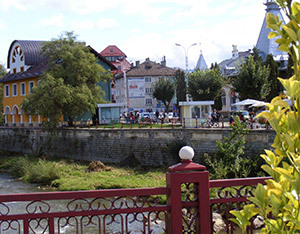 Vatra Dornei, also known as the Pearl of Bucovina, is located at the confluence of the Dorna river, Neagra Sarului and Bistrita river. 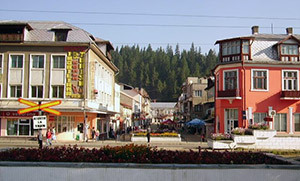 The town is well known for its natural mineral water resources. 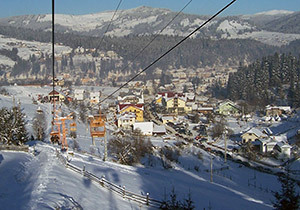 Vatra Dornei from Cable Car. The spa’s healing properties that have made it famous across the world include mineral springs, mud and strongly negative ionized air. 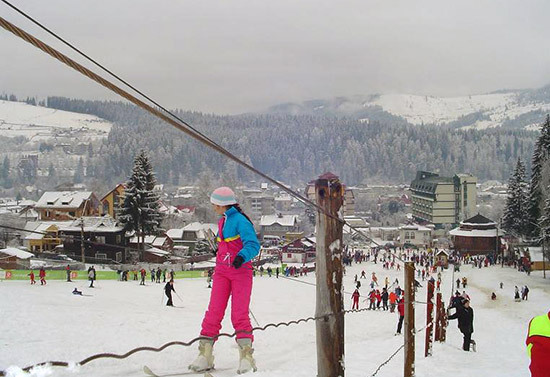 Tourists come in Vatra Dornei to treat their cardiovascular affections and rheumatism, to rest, practiced winter sports or just to have a good time. 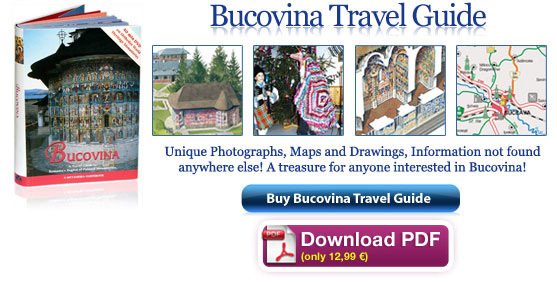 The spectacular landscape also allows for numerous leisure activities – walking, horse-riding, river-rafting, and visits to monasteries in Bucovina and Maramures. 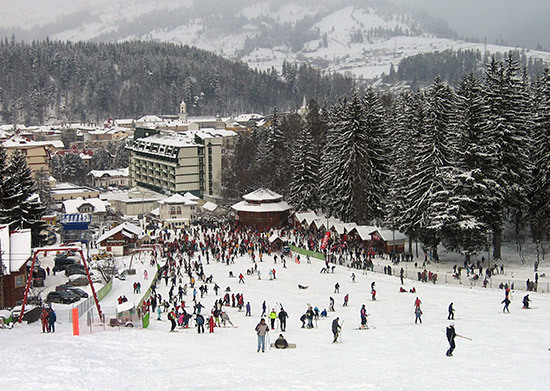 Vatra Dornei is also known a winter sports resort with its many slopes and ski lifts. 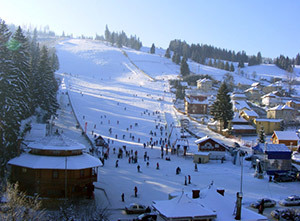 Black Hill (Dealul Negru (altitude 1.300 m)) and Runc Hill have tracks and slopes for winter sports. 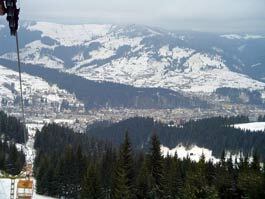 From Vatra Dornei there are routes to the Giumalau Mountain and to the Suhard Mountain. River-rafting is also very popular. 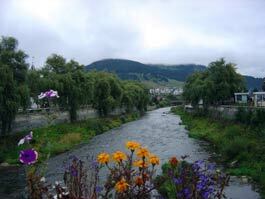 It takes place on the Bistrita river, which is ranked at 3rd degree difficulty. The best length for an expedition in spring and autumn is 12 km. 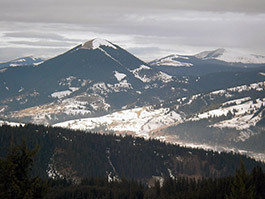 Mountain climbing can be practiced in the Rarau Mountains, where some tourists can also go skiing during the winter. Bicycle competitions are organized in spring and autumn. 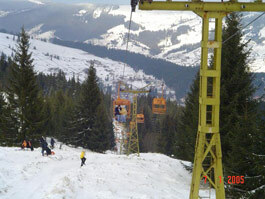 Vatra Dornei – Ski Slopes. 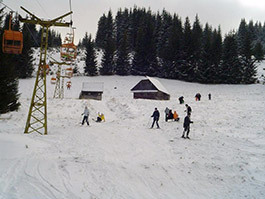 Vatra Dornei, the Calimani National Park and the Dornelor area is a spectacular location for a wide range of activities. If you have the chance to visit, it is certainly worth the trip! The Natural Sciences Museum exhibits the flora and fauna of the Dorna zone. The Ethnographic Museum is housed in the old town hall dating from 1897 (at Strada Mihai Eminescu 17. 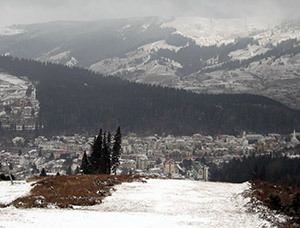 The station park, avowed like dendrology reservation and of its avenues came up from the centre of station on the inferior slope’s part of Negru Hill (1300 metres). 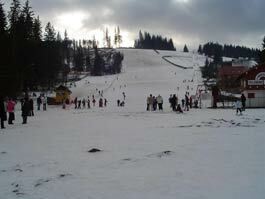 As much on Negru Hill as on Runc Hill, the winter sportsman found sport tracks and slopes for ski and sleighing practice (ski-elevator near the park). 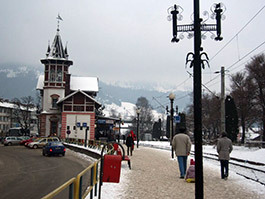 In surroundings there are small stations with mineral water like Dorna Candrenilor (3 km), Poaiana Negri (8 km), Saru Dornei (10 km), Poiana Stampei (15 km), place there are an interesting peat reservation, Ciocanesti comunne (22 km), famous for beautiful houses, adorned with wooden ornaments worked with lot of art and the front side adorned with multi-colored geometric reason, Cheia Zugrenilor (20 km), an interesting geological reservation. 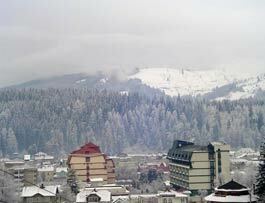 Vatra Dornei – Calimani Hotel. 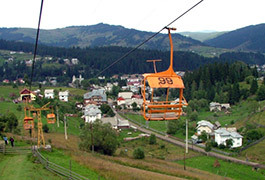 Vatra Dornei – Cable Car.